Do your children whinge much? What’s your complaint average? Do you whinge at your children? Husband? About them to your friends? Chances are that’s picked up. I wanted the kids to STOP being soooo obsessed with electronics. I complained about it. I shouted. I took it away from them. But it occurred to me last week that my husband and I are always on either our phones, laptop or ipads. I read on mine, quite a bit, it’s my way to relax but I am always plugged in. My husband is on his phone and computer for work but its also how he relaxes and gets his information. Not good if we are trying to change the kid’s behaviour in the house. So I stopped. I got conscious of reading emails on my phone in front of them. I put it elsewhere. There is nothing that urgent, if it is then I will hear the phone call. I have stopped reading on my ipad before they go to bed and I only pull out my laptop to write during day naps and whilst they are occupied in the playroom. If they see it they freak out…but they have stopped asking as much. My ears hurt less from all that pleading and crying and wanting. The time we spend together has been better quality because I am not half-here. “Be present” has been my mantra this week. Hear what they are saying. If I don’t want them to ask me something a million times then maybe I pay attention the first time, answer them properly, give them a time frame they can understand and then do it when I say I’m going to. I want them to pay attention to me. 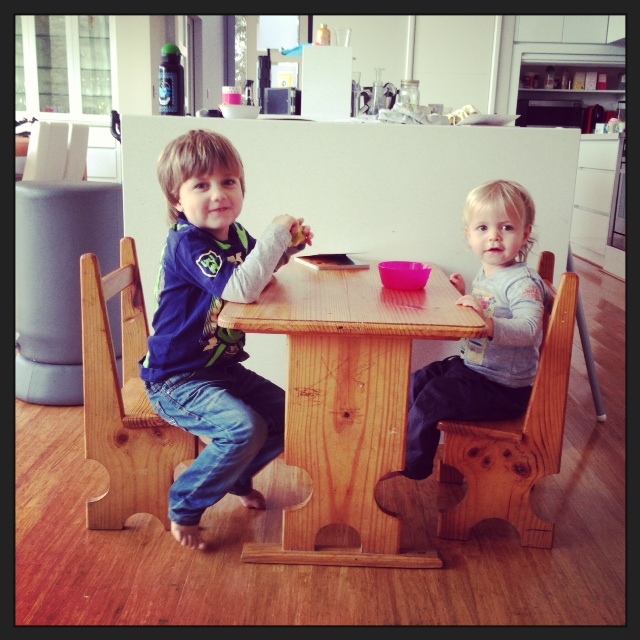 totally agree with you but I can’t think pat how much I want the boys table and chairs for my kids now! Lol! Love it! Haha, it was made for my hubby when he was little! I totally agree with you – we are the best role models for our kids even though it is not easy sometimes! Absolutely agree Nic- This is what I continue to learn and practice every day with my kiddies as well. Sometimes I am glad I never had the challenges of facebook and blogging when my kids were little! My spouse and I stumbled over here coming from a different web address and thought I should check things out.